As much as I hate to admit it, I am a country music convert. In high school I wanted nothing to do with it. I called it twangy and thought it was only about beer and girls. Maybe it was because I just connected better with my rock at the time, or maybe we are severely influenced by the people around us. Probably it is a combination of both, but I am sure my move from Colorado to Oklahoma had a huge impact. When everyone around you likes country and listens to it all the time, you learn to like it or be miserable. I learned to not only tolerate it but to love it. The stories the songs tell, the feelings they describe, the pictures they paint…it is really quite amazing, not to mention they are so easy to sing along with! That being said, I have one of the most eclectic music tastes of anyone I know. Music has always been something that has brought my family together. Between the six of us we have two flute players, two drummers, four pianists, three guitar players, a saxophone player and four singers…not to mention I can play a mean kazoo. I grew up listening to my dad playing in coffee shops with his band, my mom playing music in the house whenever she had the chance and listening to every genre under the sun. I took piano lessons until early high school, sang in different choirs through freshman year of college, played percussion in band for four years and sang with my mom and sisters in church. Aldous Huxley said, “After silence, that which comes nearest to expressing the inexpressible is music.” I think we connect with each other more in the “inexpressibles” than that which can be expressed. 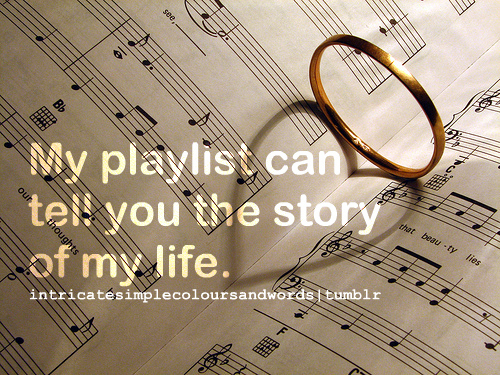 Music is this medium where we can truly relate and understand each other on a deeper level. I have this theory that a person’s iTunes Library can tell a lot about who they are and what their journey has brought them through. This is not to say that anyone could tell who I am by looking at mine, but I can certainly remember the feelings I had years ago during a phase of music. Think about it…you remember exactly where you were and what you were going through when you listen to old music something you may have never thought about again if it were not for that one song. Next time you have time to put in your headphones or go on a road trip, instead of listening to new releases, put your iPod or phone on shuffle and take a trip down memory lane. Let your mind wander to a different place, another time. Reminiscing can be one of the best ways to be reminded of the all the blessings you have received on your journey through life!